Situated on London Vale Road between Belmont Road and Route 30 at Leaman Place Railroad Bridge along a small stream known as London Vale Run near the point where it empties into the Pequea. This structure at one time operated as a water grist and merchant mill processing wheat and corn products. It is on land that was originally part of the Ferree tract belonging to Isaac and Catherine Lefevre and conveyed in 1748 to their son, Samuel, a miller who operated in the area. A road docket dated February 1748 shows that Samuel Lefevre requested a road be built to his "new mill". It remained unnamed until the mid 20th century. Samuel was a member of the "Committee of Safety" and as such it is speculated he may have supplied the Continental Army with food from this mill. Upon the death of Samuel Lefevre, his estate sold the mill in 1789 to Jacob Eshleman II who purchased it for his then twenty one year old son, Jacob III. The mill has remained in the Eshleman family ever since. Jacob III and wife, Mary Brackbill, lived the remainder of their lives here. They added on to the the west side of the brick house in 1812. The date of the east side is not known although it would have been earlier. This Jacob Eshleman acquired large land holdings and other mills in the area but this was his "home place" with his farm next to the mill. How much structural change Jacob made to the mill is uncertain. The present structure may be a combination of the old 1748 mill and substantial changes made around 1819 when a new mill race was dug. New and updated machinery was doubtless also added to the mill around that time and probably before and after. Jacob III is thought to have been the one to name the mill "London Vale Mills". After the death of Jacob III, the mill was inherited by his son, Jacob IV who operated it during his lifetime. It was then passed on to his son, Silas K. Eshleman, who had a miller named Jacob Acker operate it for him. They had an ox wagon which took flour and possibly distilled spirits to Lancaster and elsewhere. There was a small distillery with the farm buildings east of the mill. Such was common in connection with mills in those days. Some of the old machinery is still intact, but most is disassembled. The collapse of one of the floors due to overloading with tobacco hanging caused a major disruption of the interior although "the stone walls still stand, as thick and strong as a fortress". "Grist mills were a major early industry of this area and the millwrights and operators our first engineers. 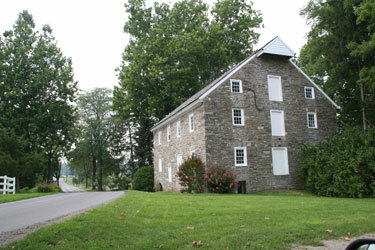 This mill with its predecessors has seen all of American history pass its door, so to speak, from its original construction in a British colony to its present existence in the U.S.A."
Information for this page has been provided by the current owner of London Vale Mills, Dr. S. Kendrick Eshleman III. Dr. Eshleman is a sixth great grandson of Madame Ferree.